Using an innovative and provocative approach, the documentary “Housemaids” (2012) offers a compelling insight into the legacies of colonialism in Brazil and its relationship to domestic workers. The film breaks the long silence about the role of domestic workers in Brazilian society, forcing people from all social classes to question economic and racial privilege and inequality. “Housemaids” premiered at The International Documentary Film Festival Amsterdam (IDFA) in 2012 and has been shown at numerous festivals worldwide, with distribution in Brazil, USA and Mexico. In an effort to further provoke debate and understanding,the film’s production company, DESVIA (www.desvia.com.br) in partnership with Myrdle Court Press (www.myrdlecourtpress.net) and the Federal University of Pernambuco (www.ufpe.br) will publish and circulate five texts about the issues that surround domestic work in Brazil. – Transformation of the natural landscape and creation of cities from an afro-brazilian / indigenous perspective. This first stage is a call for abstracts following which five authors will be invited to write full articles of up to 5000 words. One of the five articles will also be published alongside other articles written on Domestic work in a book that will accompany the DVD of the film “Housemaids” and will also be included in the latest edition of Critical Cities: Ideas, Knowledge and Agitation from Emerging Urbanists. The other four articles will be published in the online journal Arquitextos (http://www.vitruvius.com.br/revistas/browse/arquitextos). The five selected abstracts will receive a password protected link to watch the film. Film Synopsis: Seven adolescents take on the mission of filming, for one week, their family´s housemaids and hand over the footage to the director to make a film. The images that confront us uncover exposes the complex relationship that exists between housemaids and their employers, a relationship that confuses intimacy and power in the workplace and provides us with an insight into the echoes of a colonial past that linger in contemporary Brazil. The article dos not necessarily need to make reference to the film. Formats can vary – ‘in conversations’, visual essays, academic papers and autobiographical commentary. Languages: Abstracts and final articles will be accepted in English or Portuguese. Length of abstracts: From 500 to 1000 words, excluding references. Length of final article: Maximum 5000 words. – Abstracts are welcome from the 06/09/13 – 06/10/13. – Abstracts should be accompanied by contact information (full name, address, email, telephone number) and full CV. Publication Status: Only unpublished articles will be accepted. Costs: It is the author's responsibility to pay any costs incurred for the article, including photography and permissions expenses (e.g., the production costs of an image, archival or museum fees, photographer's fees, etc.). Rachel Ellis (Desvia), Deepa Naik and Treton Oldfield (Myrdle Court Press), Associate Professor Luiz Amorim (Federal University of Pernambuco), and Victor Guimarães (Organizar of the book thatwill accompany the DVD of the film Housemaids bringing together several articles on domestic work in Brazil). License: Unless otherwise arranged with the author, articles are published under the terms of the Creative Commons License. Payment: The author of the article selected for publication in Critical Cities: Ideas, Knowledge and Agitation from Emerging Urbanists Volum 4 and the book that will accompany the DVD of the filme “Housemaids” will receive a one off payment of 250 pounds once the article is published. Only one article will receive this payment. – It is the author's responsibility to obtain written permission to reproduce copyright-protected material in her/his article. – Authors selected who use images will have to send a signed declaration stating that permission for image use has been obtained before giving their Permission to Publish. – Any costs incurred for the article, including photography and permissions expenses, are to be paid by the author. Arquitextos is a monthly journal, with a scientific content about architecture, urbanism, art and culture, available on internet through Vitruvius, a webpage specialized in architecture and urbanism of Romano Guerra Publishers. 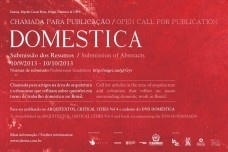 Housemaids is a publication that will accompany the DVD of the documentary of the same name and will bring together articles from a wide range of areas (including philosophy of law, sociology, anthropology, visual arts, architecture and urbanism) in an effort to provoke debate and reflection on domestic work in Brazil. This call for papers is part of a project that aims to distribute the film Housemaids to as wide an audience as possible, implementing alternative distribution strategies and provoking debate amongst diverse audiences. The project is financed by the Pernambuco state fund for culture.